The ideal size for morning muffins and after-school cupcakes. With a 24 cup capacity, you can bake a bunch of treats in just one batch, saving you lots of time. Plus, the non-stick surface allows you to pop them out easily with minimal cleanup. WILTON: We inspire the joy of creativity in everyone, everywhere, every day. Since 1929, Wilton has been helping home bakers and cake decorators all over the world create sweet treats and beautiful desserts by giving them the tools to make it fun and easy. Wilton is a global leader in cake decorating, candy maing, bakeware and party products. At Wilton, we're passionate about bringing the love of baking and decorating to every consumer. BUILT TOUGH: Recipe right is constructed of heavy-gauge steel that provides an even-heating performance, baking experts prefer for perfectly-browned baked goods. Wilton also provides a 5-year warranty on their pans. JUST RIGHT: The ideal size for morning muffins and after-school cupcakes. 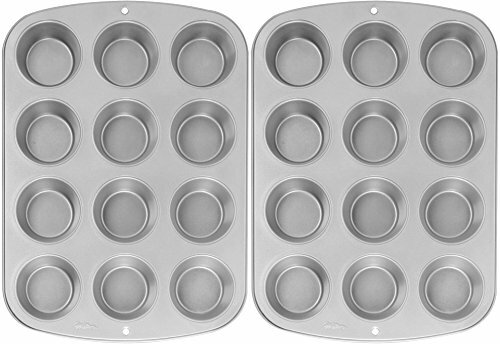 Recipe Right pan features a 12-cup design, perfect for standard sized muffins and cupcakes. EASY CLEAN: Recipe Right pan features a non-stick coating to help food slide out without any messes. The product is also dishwasher safe for your convenience. SPECIFICATIONS: Package includes: (2) standard 12-cup Wilton Recipe Right non-stick muffin pans.